Does your blog have a mission statement? After nearly 5 years, my blog finally has a mission statement. If you asked me about it six months ago, I would have had to admit that I had never really thought about it before. Since then, I’ve been reading Joe Pulizzi‘s latest book, Epic Content Marketing, and it has me itching to put some of his suggestions into action. It seems that the first step to becoming an “epic content marketer” is to take some time and write a mission statement for your blog, website, or wherever you publish your content. Joe details his idea in Chapter 13 of his book (and yes you should buy the book), so I thought I’d take it to heart and write the davidhallsocialmedia.com mission statement. Create and curate engaging content for Digital, Marketing, and PR professionals. Posts are designed to help us (myself included) better understand how social media connects with our profession and how it can be used to take advantage of opportunities that were never before possible. Now the challenge is to stick to my newly-articulated mission. Many of my previous posts deliver on this mission, and I will ensure that all future posts do. 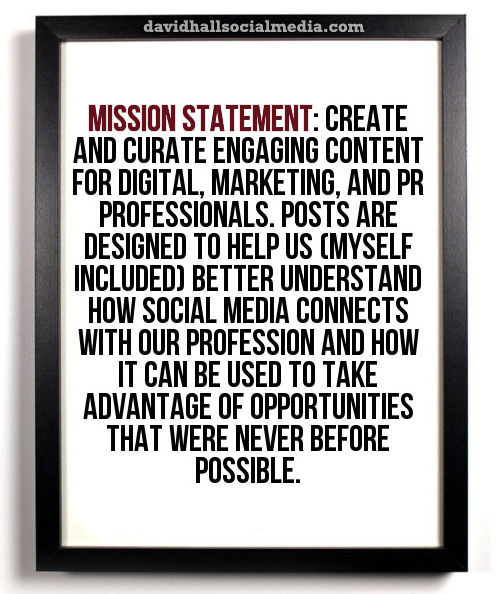 I have posted this mission statement as the first thing on my about page and plan on referring to it when I come up with a blog post idea that I’m not too certain fits this blog. If it’s not covered in my mission statement, I won’t publish it. This was a fun exercise that helped me articulate exactly why I write here. If you’re a content creator, I suggest giving it a try. What’s the worst that can happen? Joe: If you’re reading, and you’re probably not, I’d love to hear what you think. Feedback = Awesome. We all know this. Post regular, quality content, and you’ll be successful. The problem is, this is very hard to sustain. I’m not a professional blogger; I don’t get paid a cent for a single word. That’s OK, because that’s not the purpose of this site. I measure the success of my site by views, comments, and shares. It took about a year of me blogging at least once each week for traffic on the site to really increase. As I continued the one-post-per-week model for another year, traffic nearly tripled. In January 2013, my wife told me that we were pregnant. Fantastic news! I decided to focus on the immediate tasks at hand and willfully neglected my blog. I didn’t publish another post until about 9 months later (I wonder why). Most of 2014 was spent with my new son, only blogging sporadically. I loved this time, but my blog traffic certainly didn’t. This lack of new content really hurt traffic on davidhallsocialmedia.com. Now in 2015, my goal is to resume the one-post-per-week model to see what happens. Example of the Facebook thumbnail that requires blogs to have embedded multimedia in order to work properly. As you are writing every post, think about trying to make it as easy as possible for your readers to share it. To do this, I focus on three main components. First, be timely. My most popular posts are the ones that are published (or promoted) during times of the year when people want that content. If it’s Christmastime, find something interesting to connect your topic to that observance. Same idea goes for the Super Bowl, first day of school, or even shark week. Second, always include at least one image in your post. Make sure it’s not awkwardly proportioned, too large, or too small. I also try and put it right at the beginning of the post. I do this because, yes, it’s nice to see an image above the fold when landing on a website, but more importantly, many social media share buttons automatically grab an image from your post to accompany that link when it is shared on your personal network. The most visible example of this is the Facebook thumbnail; Twitter, LinkedIn, and Google+ also do this. Finally, forget Facebook; the headline of your post is your best promotional tool. 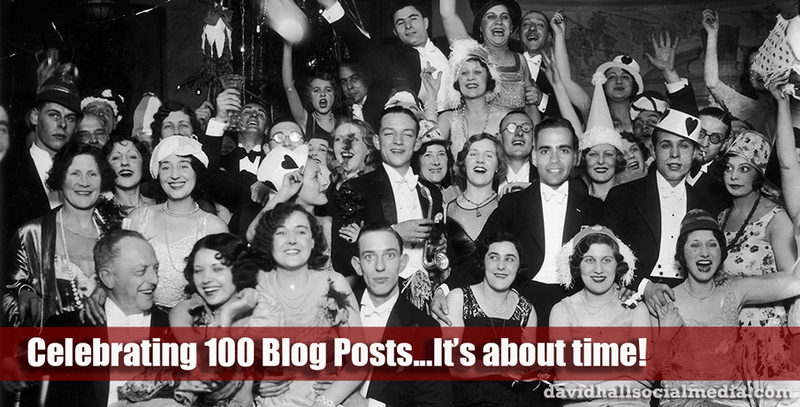 It’s important to try to convey one interesting message from your post in 100 characters or less. Try and get one key fact or statement into your headline. It doesn’t have to be a summary of the whole post: just a key point, statistic, or opinion that may get people to click. During the 6-week blogging assignment in the Social Media Management course I teach in Algonquin College’s PR program, I encourage my students to think of the headline of each of their posts as a tweet. You need to be comfortable with writing content that nobody likes. If you haven’t published a failure of a post, you haven’t blogged. I’ve written some blog posts that have gone nowhere. Back in 2011, nobody was interested in what I had to say about Trendsmap and finding geographically relevant tweets. Only about 50 people viewed it right after it was published, and now 4 years later, it has a whopping 160 views. According to the viewership, comment, and social sharing statistics, that post is garbage. I still love Trendsmap, so I’m good with it. You won’t know who your readers actually are until you publish for a few months, better yet a year, and pay attention to your site’s analytics that tell you what countries your viewership is coming from, what search terms are referring to your website, and what social media networks your viewers are finding you on. My readers, for example, are primarily Americans who work in the Marketing / PR world. This doesn’t meant that I don’t get plenty of readership from my home and native land, but it does mean that I write posts with the majority demographic in mind. Useful content is sometimes better than thought-provoking content. I try to be helpful to my readers by posting how-tos, infographics, and resources that I have found useful in my own life. Posts of this nature, along with the timely ones, tend to get the most viewership. I do also write for myself. These pieces don’t generate great traffic, but they do give me an opportunity to think through a few ideas and try to organize them in a somewhat articulate fashion. I imagine that this post won’t be wildly successful based on views, but it’s important for me to write it. I have gone through the experience of writing 100 posts, and without reflecting on it, it would be a personal learning opportunity missed. 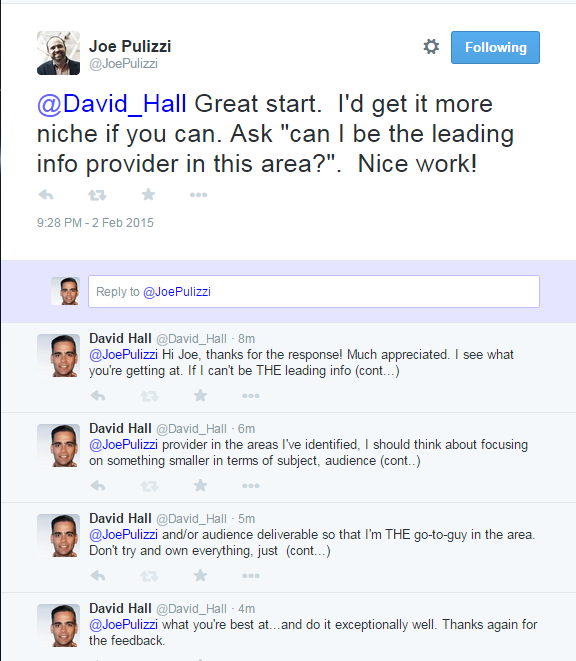 You’ve probably noticed recently that posts, or re-blogs, from different authors have been appearing on www.davidhallsocialmedia.com, and may be wondering what the deal is. 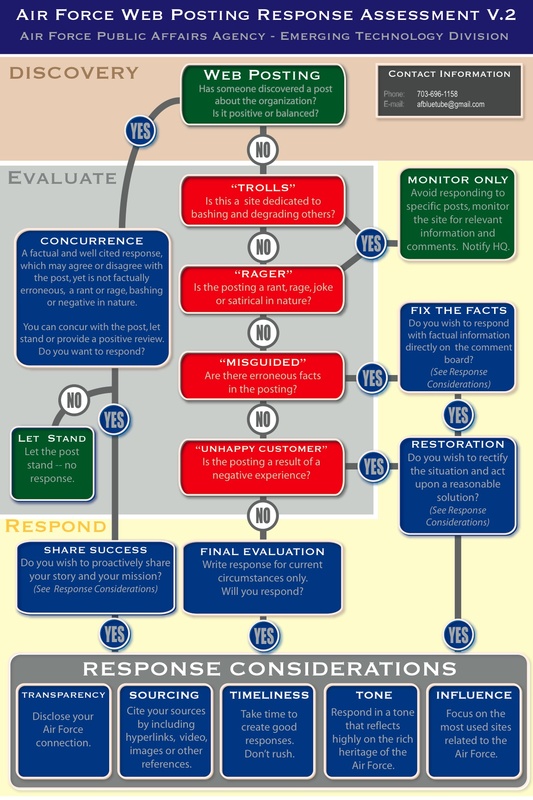 Re-blogging is quite simple. Essentially I am sharing a post from another WordPress blog on my site, with a few additional comments of my own. Once I find a post that I think my readers would be interested in, all I have to do is click a little button, add some text, and it’s done. Readers of www.davidhallsocialmedia.com get fresh content from a different viewpoint. The original author is clearly credited for their work and has it exposed to a new audience. I get to share new voices and topics on my blog that I otherwise would not have had the opportunity to, in turn creating a better site / collection of posts. The bloggers that you are reading in these re-blogs are students in the Social Media Management course that I teach. Their major project in first semester is to create a blog related to Public Relations, start publishing posts, and promote their work. Originally, I hadn’t planned on re-blogging their posts, but some of the posts were so interesting / well done, that I thought www.davidhallsocialmedia.com readers would find them to be a valuable read. So you’ve started a blog and now you’re wondering why nobody is visiting. You’ve done everything in Blogging 101 and Blogging 201, but you feel invisible. Your next step is to start sharing and promoting your blog to drive readership. Promotion of your blog should be a part of your overall blogging strategy. Remember, you won’t be an overnight success, as it may take months and months of consistent blogging and promotion to build a loyal following, but here are a few tips to get you on the right track. 1. Set goals. If you fail to set goals, you won’t have a target to aim for and you will have no way of knowing if your blog is a success. I can assume that if you are reading this post, you’ve already made the decision that you want more than just friends and family to be reading your posts and you want to reach as many people as possible, right? So set some goals, and be realistic. Would you be happy with 100 pageviews a week? 1,000? How about 20,000 page views a year? Really think hard about how successful you think you can be in your first year and shoot for that target. You don’t have to just set pageview goals: think number of comments, interactions, and shares too. 2. Leverage your social networks. Here’s an easy one – use your existing social networks to spread the word about your blog and each new blog post. Twitter is by far my most useful referral tool. Be sure to use relevant hashtags to insert yourself into conversations, thank people for RTing and commenting on your work, and tweet at the best time of day (for most industries that’s between 10:00 a.m. and 4:00 p.m.). This behaviour helps to encourage feedback, shares, and comments. At the same time, as you are promoting your blog on social networks, you should also be actively trying to continue to build a following of your target audience on these networks. For example, if you are writing about local food, seek out, follow, and interact with those who like to post about food in your city. Facebook and Google+ are starting to provide some decent traffic for my blog, and don’t forget about social bookmarking: reddit, digg, stumbleupon, etc. 3. Think SEO when writing content and headlines. Admittedly, I’m not an SEO expert, but we can all use a few key principles to help make our content more attractive to search engines. First, be sure to use common search terms in your headline. You can check out Google Adwords or Google Insights for some help in determining what they should be. Second, in your body copy, be sure to use these same search terms and link them, where possible, to other posts on your blog, or major sites online (i.e. Wikipedia). Finally, if you have images on your blog (and you should), be sure to use these same keywords in the name and title of the image file. There’s way more to SEO than this. For a more complete tip-sheet, check out this list by Reverse Delta. 4. Share the “link love”. Often ideas for your own blog posts will stem from what you’ve read on others. If I’ve pulled an idea, topic, or infographic from another blogger or website, I always reference where the material came from and reward them with a link-back to their site. The link is still the currency of blogging. Simply put, the more influential pages you link to, and who are linking to you, the higher your blog will return in search results. 5. Get other people talking about / sharing your content. Start by doing the simple stuff. Make sure your comments are open and include buttons to share, like, tweet, rank, email, stumble, digg, etc. The easier it is for your readers to share, the more referrals you can expect. Next, Join the conversation with other bloggers by being active in the blogging community. You should be liking, commenting, reviewing, and critiquing (professionally) other blog posts. If the idea for your latest blog post was a reaction to something you read on another blog, be sure to return to that blog and post a link to your reaction in the comments section; remember, your are continuing the conversation, not attacking the other opinion. 6. Consider guest blogging. If you are an established blogger, be open to the idea of contributing a guest post to another blog with a similar focus. You may also be approached to have your existing content syndicated on other blogs: this is a good step too. Another way to expand your audience is to invite another thought leader in your field to contribute a post to your blog. This not only provides your readers with new content and a new perspective, but also it avails you to the loyal following of your guest blogger…who, I would assume, would help to promote his/her post on your blog to his/her readers. 7. Use offline promotion techniques. So you want to turn pro? Well, I’m not there yet, but consider the use of traditional marketing materials to drive traffic to your website. This can take the form of almost anything: posters, flyers, stickers, post cards, club cards, t-shirts, hats, bumper stickers, coffee mugs, etc. If you choose to do this, be sure to include a unique, and trackable URL, so you can evaluate how many visitors your campaign has generated. At the very least, you should include a URL to your blog on your business card. 8. Don’t over promote. Sometimes you just need to give it a rest. All bloggers can admit to themselves that they may have crossed the line when promoting their blogs, but it’s good to not make a habit of it. I try to promote my posts for about 24-36 hours, then let them flow down stream. Is there anything else that should be on this list? Leave a comment and let me know. NOTE: They also have a 25+ page Social Media and the Air Force document (PDF) that details guidelines, trends, and best practices. Content is the most important ingredient for any media, and blogs are no exception. Coming up with, and delivering, quality content is often challenging, so here are a few tips to help you generate content to keep your readers coming back. 1. Stay on topic. Be sure to only blog about things that are relevant to your blog. For instance, if you blog about fashion, don’t include a post on why your favourite restaurant or sports teams. If you start to stray from your original focus, your blog will no longer be about your passion/interest: it will be about you and, as mentioned in blogging 101, nobody really wants to read a blog about you. 2. Limit yourself to one main idea per post. Often there’s a lot to say, but you can’t say it all in one post. Here you should pick out your most important point and stick to it. If there really is too much to say, consider using the series approach where you blog several times about the same topic… i.e. this ongoing blogging series. 3. Pick a side and share your opinion. You don’t need to be negative about it, just have an opinion. These posts often generate a lot of traffic and comments as people want to contribute to the conversation. 4. Write about news and current events. Find something in the news and blog about it. There is not always an obvious connection between your blog topic and what’s hot in the news, so it’s up to the blogger to find, or create, that connection. For instance, I wanted to blog about the recent Canadian Federal Election, but the question was what to blog about. Once I saw a news story about how job postings were made to hire people to post right-, or left-, wing comments, I knew I had found my topic. 5. Be useful. You want to add value for your reader. Consider sharing a resource, experience, expertise, etc. Don’t be afraid to share some of your “industry secrets” and how-to posts are always popular if you can help people with a common problem you’ve solved. 6. Vary the types of posts you make. Consider using different formats to present your information to keep the reader interested. You may want to use how-tos, top 10 lists, opinion, infographics, reviews, case studies, or even interviews. 7. Write straight-forward and catchy headlines. People decide if they are going to click on your post based on the headline, so it’s important to capture what your post is about in as few words as possible. The strongest headlines add the elements of interest, wordplay, and/or humour. I’m always writing, and re-writing, my headlines to be sure I come up with something that fits. Reading other blogs can often help get the headline juices flowing. For more on effective headline writing, check out Blogging 301. 8. 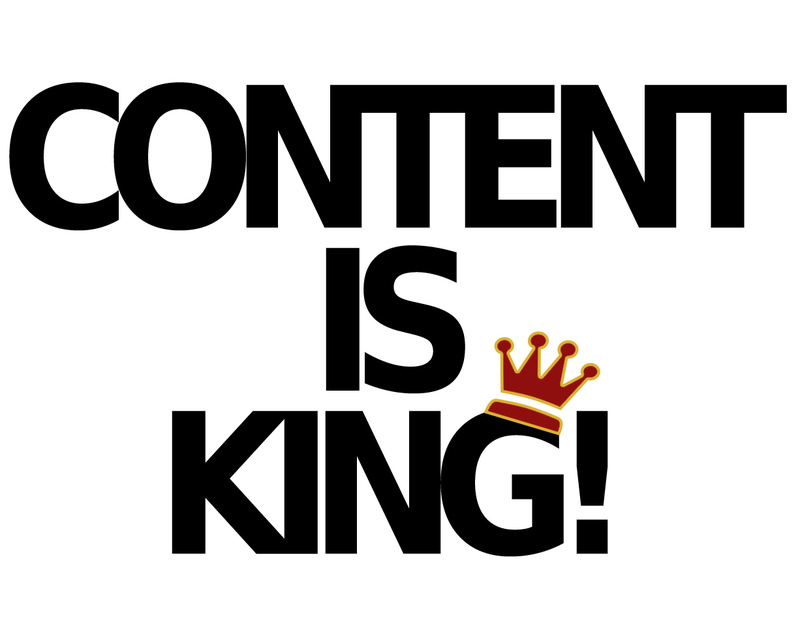 Make sure your content is consumable. People don’t read the internet, they scan it. Use a combination of lists, images, graphs, charts, and different formatting options to make your key points stand out. Also, make sure to include a photo, image, or video in each post – this helps to visually break-up your text and adds interest to the post. 9. Set a schedule and stick to it. Being regular is important. If you set a regular, and achievable, schedule to create new posts, you and your readers will get into the routine of creating and consuming your content. Professional bloggers often post everyday, but others who have a different day-job will post once a week, or a couple times a month.